A lush landscape provides shade for the pool and inviting fire pit areas, where diving contests and s’mores are regular summer rituals. A pagoda-inspired pergola makes a welcoming shelter by the pool. The kitchen strikes a balance between modern and traditional with its leaded-glass-front cabinets painted a rich green. A Dunes and Duchess chandelier in an unexpected bright red illuminates the island. Cozy velvet chairs and an oversize wool sofa make a convivial seating arrangement in the great room. Reider added spark to the quiet palette with accents of gold. A fun powder room pushes the design envelope. “You might not want to see that pattern in a large room, but here, it’s a little surprise,” says Reider. Benjamin Moore’s Arctic Shadows trim lets the parlor’s rich architectural detail shine. Metallic paper on the ceiling ramps up the glamour in the show-stopping dining room. Reider’s color scheme for the room, like the rest of the house, is based on neutrals energized with jolts of vivid color. 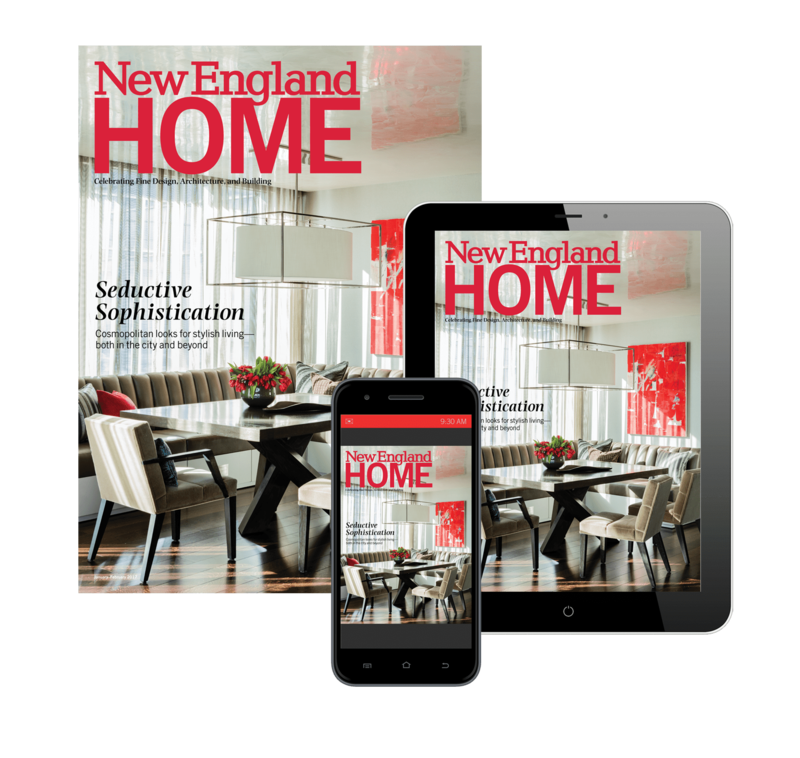 Homeowners Sandi and Chris Wright had different ideas for the foyer, so designer Rachel Reider made them both happy with the red-wine-colored paint for Chris and white marbleized wallpaper for Sandi. Lotus-patterned wallpaper makes a bold background in the dining room. Reider salvaged some of the great room’s old wallpaper, pairing it with gunmetal paint for a contemporary touch. Its new homeowners loved the 1882 Queen Anne Victorian for its historic charm as well as its location on a quiet Southport street within walking distance of both the beach and town. A once awkward space off the main entrance now functions as a sitting room. The occasional antique lends eclecticism to the contemporary interior. A custom bench is reflected in a mirrored dresser in the bedroom. In a departure from the homeâs cooler tones, Ouellette designed this bedroom around a floral pattern she loves. Louis Ghost chairs cozy up to a white pedestal dining table; a purple chenille sofa adds a pop of rich color. Ouelletteâs collection of art glass is housed in specially designed wall niches. Other hues, such as the shell-pink accents, are also drawn from nature. With an eye toward geometric shapes, Ouellette painted all of the artwork in the house. Homeowner/designer Margo Ouellette chose a palette of blues and greens to represent the ocean and sky. The entry, displaying just a few of the objects the homeowner has collected over the years, hints at the easy comfort of the house. Joslin incorporated steel, wood and stained glass in the entrywayâs ornamental stairwell, a design repeated in the screening to the dining room beyond. In the master bedroom, a framed banner unearthed at a tag sale recalls days spent on the Cape. Shelves burst with books and antique night tables keep essentials at hand. Restoration Hardwareâs Frette linens and Ralph Lauren custom pillows cozy things up. Faux-bookshelf wallpaper by Brunschwig & Fils gives the reading room added personality. A cozy library off the kitchen sports club chairs covered in Lee Jofa fabric and a coffee table from Bungalow 5. The bar table is from Lillian August. More clever juxtapositions unfold at one end of the living room, where Byrd Swiftâs vibrant painting teams with an antique tea table and family heirlooms including a rose medallion bowl and silver candlesticks. A gold rabbit from Bunny Williams's BeeLine Home collection adds a whimsical note. Symmetry, as in dual corner cupboards, twin ladderback chairs and matching upholstered dining seats, fosters a calm and serene air in the dining room. The Ralph Lauren fabric for the chairs and drapes was repurposed from the Rooms with a View show house sponsored annually by the South Congregational Church in Southport. An antique table anchors the entry. The bar table is from Lillian August. Like his mentor Albert Hadley, Rogers is skilled at blending styles and eras. The living roomâs lookalike French Chesterfield couches came via a local estate. The custom pillows are by John Robshaw. An ornate lacquered bombÃ© chest in the family room anchors a custom leather sofa. The sculpture Trophy Wife hangs on a curved wall leading to the breakfast area and kitchen. Life imitates art in the form of an orchid displayed in front of one of homeowner Judi Rotenbergâs bright paintings. A crystal LED chandelier that changes color illuminates the entry, with its book-matched marble tile floor and a painting by Sheila Gallagher. An open floor plan gives the apartment its airy feel while still providing enough wall space for art. A shimmery silk from Robert Thompson covers the dining chairs, playing off bold bluesâincluding a glossy InterlÃ¼bke sideboardâin the dining room. A crystal Schonbeck pendant light gleams above the table. Vibrant art and a Design Within Reach ceiling light set the dining room. Barnes tried tables of various sizes and shapes for the kitchen and ultimately selected a long, narrow table from Leonards, which makes a perfect match for the built-in banquette. The kids’ bathroom closes with a sliding barn door outfitted with glass panes that sandwich chicken wire. Lights above the kitchen island are kept slightly high so as to not impede the view. Davies’s own guitar makes a fitting prop when she’s not practicing for the lessons she and Jesse take together. A dynamic mural by Rosenthal adds energy to the large, sunny master bedroom. All of the doors to the house are painted citron, adding pizzazz while being appropriate to the rural setting. David Hicks wallpaper sets the mood in the dining room, where, instead of a chandelier, a "hair-dryer" lamp illuminates the vintage table that sits on hide rugs. The iron-and-glass kitchen table is a family heirloom. In the mudroom, carved wooden birds flock on plaid Schumacher paper above an antique woven cafe table and chairs. Antique beams give the kitchen a sense of continuity with the original house. Salk painted the backs of the built-in shelves chartreuse to give them definition and make the books pop. The window seat is upholstered in fabric from Ballard Designs. Serena & Lily linens are topped with a colorful pillow and throw from J. Seitz on the master bed. Eric’s study holds a daybed from West Elm and an owl print once owned by designer Miles Redd that Susanna bought at a benefit. A modern table and bench in the front hall represent contemporary country style. A pillow from Pier 1 enlivens an old settee from Mitchell Gold + Bob Williams that Susanna reupholstered in an ikat fabric from Ballard Designs. A vibrant red chinoiserie bar from a consignment shop has a bold, sculptural presence. The breakfast area gets its energy from the large-scale pattern of the York wallpaper and the playful zebra stripes on the chairs. Dragoo designed the tufted headboard in the cozy master bedroom. A custom wood-veneer shade tops the midcentury Scandinavian lamp that sits on the Natuzzi sideboard in the study. Heirloom lithographs depicting farm scenes hang above the study’s fireplace. The dining room’s dark walls "make things pop," explains the designer. A colorful Oushak carpet sets the library’s welcoming tone. The George Nelson pendant lamp adds a modern note, while classic articulating brass lamps from Michele Varian aid nighttime reading. The dining room exemplifies designer Marc Langlois’s suggestion for a transitional decorating plan. A shag rug and a Josh Urso resin coffee table bring a 1970s vibe to the living room. Chiappone gave the dining room a casual, beachy feel with a floral-inspired chandelier from Roost, painted bamboo chairs, and a sisal rug. Custom banquettes turn the space just off the entry into a peaceful resting spot. A vintage hand chair is the first thing to greet visitors to the house. An Angela Adams rug picks up on the blues of the Global Views lamp on a West Elm side table. An Italian chandelier casts a glow on a custom table by Keith Fritz. The multipurpose wall is "like a sculpture interacting with the art," explains architect Carlos Ridruejo. "Based on the simple geometry of an exploding square, its design is intended to create interest, not overpower." The owners take pride in their art collection, which includes the bronze sculpture by Pablo Eduardo. A red ceiling, Osborne & Little wallpaper, and a Tom Dixon hanging light bring drama to a powder room. The designers fulfilled the homeowners’ desire for color by outfitting the dining room in a stunning emerald hue. The long dining table is crafted with a slab of distressed wood that gives the glamorous space a homey touch. 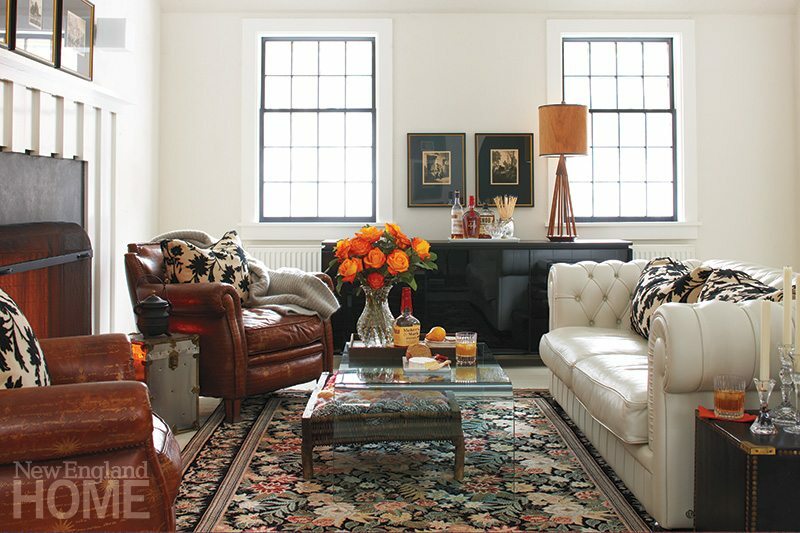 CJ Katz layered colorful furniture and accessories with modern appeal over the front parlor’s original woodwork. The John Rosselli chandelier is, says Cheryl Katz, "a way to think about a chandelier that has power, but isn’t crystal." The rear parlor offers echoes of its front-room neighbor, but conveys a more casual feel. The master suite’s ornate mirror and console came with the house and had previously adorned the main stairwell. The master bedroom sets a bold tone with a richly painted red accent wall.